Sankisa is related to many Myths pertaining to Lord Buddha, especially his descending from the heaven after death makes it an ideal destination for Buddhist pilgrims. The place is as interesting as the stories related to Buddha, charming, quite and enchanting. Known as Sankasya in Ramayana, this village has been an important centre in the geography of India from earlier times. Huen Tsang named this city as Kapittha in his travelogue and described it as a nice place to visit. The place is renowned for the stone statues found here during the excavations. Sankisa is located in Farukhabad district of Uttar Pradesh, at a distance of 40 Km from Kannauj. The village is mainly famous for the archaeological and historical importance. There is a small temple of BISARI DEVI where, she is worshipped as a goddess of fertlity. Buddhist sculptures dating back to Mahayana age is also found on some walls at the site. The remains of Asokan Pillar is also worth a visit, while the pillar with an elephant in lieu of the usual lion is also matter of attraction for many a tourists. This elephant is said to be the representation of the white elephant which mayadevi had dreamt at the time of conception of Siddhartha (Lord Buddha). 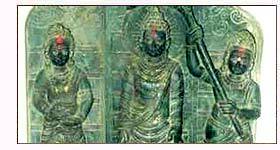 The excavations by ASI (Archaological Society of India) has lead to the finding of many items of ancient age contemporary to Buddha, Asoka and some other well-known preacher of Buddhiism. Some of these items are exquisite and represents high grade of art. The scriptures, terra cotta figures, bronze coins and stone dishes remain the centre of attraction for the visiting folk to have a glimpse back into the far left times. The Shiva linga is also quite exotic and attracts Hindu religious devotees. The Shravan Mela held every year draws a lot of tourists. Kannauj : An ancient town in India, having its place in many important books such as the Mahabharata, this place is well known for the Brahminical relations. Ruled over by Hindu king Harsha Vardhana, this city had seen the golden period of Hindu architecture. Many of the sculptures have been excavated recently and the various statues, among them the ekmukhi (one faceted) with the head of Lord Shiva's wife, are special. The place is also a well-known Perfume production place right from the days of Harsha. 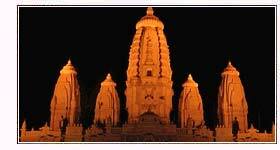 Kanpur : Kanpur is a well-known and admired city in India. It is also a destination for the scholars from early Hindu civilization days of India. There are a whole agmut of places to visit in Kanpur, the prominent among them being Shri Radhakirishna temple, Phool Bagh, Jajmau, The Glass temple, The All soul's Cathedral, Nawabganj Bird sanctuary and the Allen forest Zoo. Air : The kanpur airport is nearest to Sankisa, from which, trains and buses run regularly. Rail : The nearest railhead is Pakhna, at a distance of 12 Km. Road : Sankisa is connected to the major cities of the state by good motorable roads. Staying can be most enjoyed at Kanpur. The Landmark is a fine hotel.